The Nuclear Regulatory Commission has begun a technical review of a license for an interim storage site for nuclear waste in New Mexico -- and that's a hopeful sign for those fighting to find an alternative to burying spent nuclear fuel 100 feet from the beach at the now-closed San Onofre nuclear plant, in northern San Diego County. The Eddy-Lea Energy Alliance, a coalition of cities and counties in the southeast corner of New Mexico, is ready and willing to accept nuclear waste — for a price. Holtec, the company that designed the latest waste storage at San Onofre, applied for a license last spring to build an interim storage site on 1,000 acres purchased by the alliance. Now, the NRC has agreed to consider it. John Heaton, chair of the Eddy-Lea Energy Alliance, said there are more than 30 states around the nation waiting for a safer place to store nuclear waste. Current federal priorities are to move the oldest nuclear waste first. 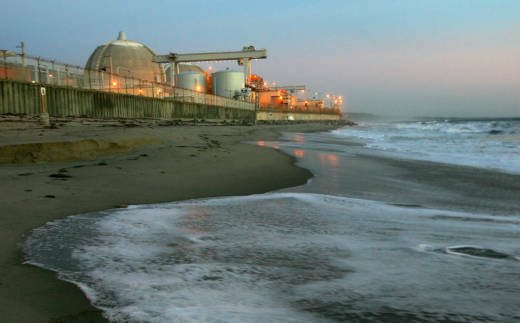 But Heaton said if this license is granted, Holtec, a private company, could have a say in which nuclear waste gets priority, and San Onofre should be high on the list. Heaton said Congress has refused to consider interim storage sites like the one in New Mexico and refused to release billions of dollars in a fund originally intended for a stalled permanent storage site at Yucca Mountain. “We think that the reality is that if Congress sees that a facility is in fact licensed and ready to operate, it may, in fact, change their mind,” he said. Whether Congress changes its mind or not, Heaton said, ratepayers and taxpayers are paying for the storage of nuclear waste. The federal government has failed in its obligation to find a long-term storage site, and utilities are suing the U.S. Treasury for the costs of storing waste on site, he said. A key issue is the liability for any future problems with the waste, which remains radioactive for thousands of years. Holtec said in an email that it is willing to take title to the fuel, provided appropriate contracting conditions are in place.